THE MODERATOR: We're going to ask the coach to make a statement on the game and then we will go to questions for all four gentlemen from Buffalo. NCAA Nate, please. NATE OATS: I'm really proud of our guys. They showed their experience. We kind of settled in there after about the first 8 minutes on defense and forced some tough shots. You know, I told these guys coming in, if we can get our turnovers down and win the rebounding battle, I think we'll win. We dominated them on the glass, which was big because we were undersized. They were definitely bigger than us. Our turnovers, we didn't take care of the ball as well as we like. We have to clear that up Sunday. The rebounding I was really proud of the way the guys battled on the boards. Q. NCAA Tournament, Nate, these three guys there haven't been a lot of games this season where all three of them had huge games. Today they get 20, 20 and 18. And Jeremy and Nick both ended up with ten rebounds. How good can this team be if those three keep playing like this? NATE OATS: Combined for 60. It's March, win time. These guys are s big-time winners as you can get. They know when it's time to show up. We call Jeremy "Mr. March" for a reason. Nick had 20 as a freshman when we played Miami. CJ has been pretty good. I'm sure he's approaching being the all-time leading scorer in history. These guys showed up this year. I think they know what has to get done to win big games, and they did it. 21 and 10, and 21 and 10, two guys double-doubles when really we were outmanned and outsized. Jeremy was huge for us on the glass. He had six with us at the half. I was happy with the effort on the glass. Q. This question is for Nick. When you went in about five minutes into the game, what did you see? You're pretty good as coming in and kind of making a quick evaluation of what your team is doing. What did you see that your team needed to do at this point, and what did you do to really make an impact on changing the dynamic of the game early on? NICK PERKINS: I thought the first four minutes they beat us to the punch. I previously told the guys, "You need to pick our pace on offense and get out and run on defense when we get stops." I think once we started doing that, that's when the game changed. Q. All season were you building your resume to impress the selection committee to get a better seed? Was there any mindset, even though your fate has already been sealed with seeding, to make a statement with this win here in the first round? JEREMY HARRIS: I mean, we're not really looking at the seeding anymore because everybody's record is zero and zero when the tournament starts. We try to lock in on the scouting report and just do what got us here. CJ MASSINBURG: Yeah. For me, I would say that there still is one more statement to be made, just prove we belong with anybody in the country, you know. Some people that picked us to lose this game that we just played, so they might have thought that hey, they're just being hyped all year and stuff like that. So, I think we can play with anybody in the country, and we're going to try to make this deeper run. Q. Kind of going off of that, what's it like to win an NCAA Tournament game the way that you did, but also the fact that you were expected to win this game. You were favored in this game, something that hadn't happened the previous three times this team has been to the tournament. NICK PERKINS: I would say, you know, the NCAA Tournament, kind of like Jeremy said, everybody is zero, zero. 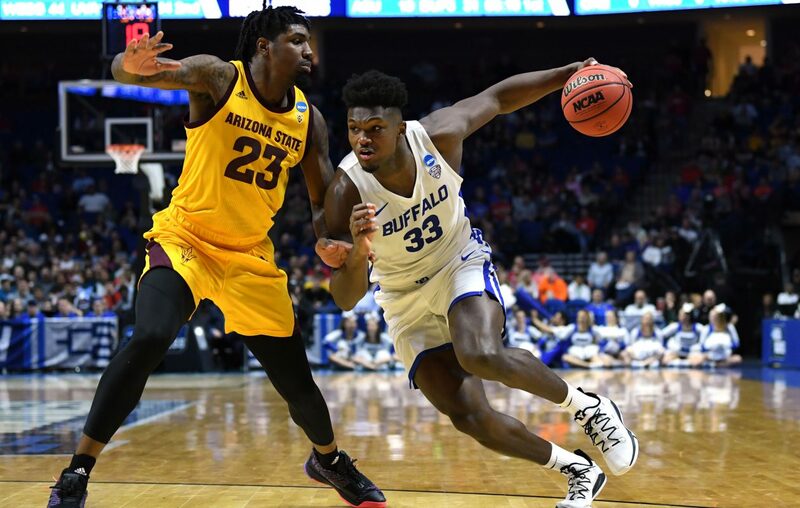 Something different for Buffalo a mid major from a lower conference from some of these other schools. Good for the city and the program that we're able to be favored for an NCAA Tournament game. That probably hasn't happened in Buffalo history. I think it's a good thing. JEREMY HARRIS: Can you repeat the question? Q. Just saying that what is it like to win this game, not only the way you did, but you guys were expected to win. What is it like to do that, knowing that you were expected to win? JEREMY HARRIS: I mean, of course it's a great feeling, it's March Madness. I think when the horn went off, we didn't celebrate as much because we feel like we can play with anybody in the country. So I mean, it's good to get a win, but we're not done yet, I don't think. NICK PERKINS: Just slowing down. I think the MAC, the MAC conference, you know, I was kind of rushing things, rushing my shot, just rushing my play. I think tonight I was able to slow down a little bit mentally and just convert. Q. How did your team contain Arizona State at the perimeter? I think they had 7, 8, three-point shots. I don't know the exact number. CJ MASSINBURG: I would say our ball pressure and just playing team defense, you know, and it also helped with our spacing. They were kind of congested. So, weren't really that much help to be needed, but it's ball pressure. NATE OATS: They were 3 for 22. We did an unbelievable job guarding the three-point line. They played two bigs. They're big up-front and typically they're two bigs except when they bring Cherry, they don't have a shooter. It's kind of what CJ was eluding to. With the spacing, you're able to kind of help a little bit more with having two non-shooters out there, which enabled us to crawl into the ball a little bit more. Somewhat what we did against Arizona last year. Got -- they got really good guard play. They're not that deep. I also think playing Wednesday night and having to fly in here kind of late Wednesday night, they may have like tired legs and they missed some open shots, too. I thought our kids played hard and they had tired legs, and we definitely didn't want to give up inside play. We were fronting the post. They skipped it a couple times, got some open looks and did the right thing. Just missed them. So -- but we knew they would be tired and we kind of planned on some of that. Q. First couple possessions each of the half they went inside and were kind of controlling it for a couple plays. What did you guys do to go on some big runs and change the flow of the game in each of the halves? JEREMY HARRIS: I mean, I'll take the blame for that one because I was supposed to be fronting the post both times so I didn't. Of course, he's bigger than me and stronger, but I figured it out and it didn't happen as much afterwards, so just following the scouting report. I lost focus a little bit, but I got it together. NATE OATS: Part of it was the ball pressure wasn't great either. We had to pressure the ball. Everybody kind of came together. Jeremy had to guard Ristic from Arizona. He's done a good job. He's our starting forward and he's really six-seven, two guard. We got to help him out a little bit with ball pressure and backside help. We kind locked in. I wasn't happy with our start to the game. We gave up four points in transition and gave him some easy at the rims twos and once we settled in, knowing we couldn't win the game playing defense like that, everybody picked it up. Q. Nate, kind of two parts to this. It looked like you kind of tightened up the rotation a little bit, only going with seven guys, and I think this goes hand-in-hand, Jayvon Graves gave you guys a pretty nice spark. NATE OATS: He's really good. He's been playing really good basketball for the last month and a half, two months. He's really talented. His defensive abilities have really stepped up, which then I've been telling -- Jeremy leads us in scoring and him and Nick tied. Jeremy had the hardhat tonight and won it. Nick had the highest plus minus, plus 21. When you're doing rebounding defense, it's good. Yeah, it's a little bit easier to shorten the rotation up, like these timeouts are seem like they're about five minutes long each. There's more timeouts seems like, just -- you know, we want to run, but you can keep playing at our pace, and I got couple freshmen down there that are going to be great in the future, just I didn't like the matchups a little bit tonight. That was part of it. Maybe the matchups will be a little bit different. If you look at Dort and Edwards, they had big, strong physical guards that just -- wasn't the matchups weren't there. So we did shorten the rotation up. You're able to do it with the way the timeouts are in the this tournament. Q. NCAA Tournament, obviously heading into this, the big story line was you against Bobby. What are the emotions like going against him and certainly the outcome of the game? NATE OATS: I mean, I thanked him for everything he done for my career before the game. He's a good friend. We kind of said on Sunday night when we talked, "Let's be friends before and compete like crazy." I think we both coached really hard. I just tried not to look down the other way and just coach the game. Try not to worry about coaching against a good friend. Just worry about coaching my team and our players -- our players are more experienced. It's a little easier. We had a 6 seed. We talked all year about how good our regular season needs to up our seed. We were rewarded with a 6. They had to play Wednesday night. They were more tired, and we took advantage of it. After the game, he was super complimentary, said our kids played so hard coming from one of the hardest playing guys that ever played -- former MVP, couple national championships. He played hard. Said our kids are some of the hardest playing kids he's seen all years. Felt like there were seven guys on the floor they had to play against. We'll touch base I'm sure here in the next few days and renew the friendship. Q. Is Caruthers okay? I didn't know if he came back in after game? NATE OATS: He came back in and hit two free throws for us. He was a hundred percent at the free throw line. Him and -- everybody is banged up. It's the middle of March, the season is long. You start practice in September, about middle of March there's nobody -- I mean, they all got something. Remy was a little bit more banged up than normal but Dontay got something, Davonta has got some. Everybody got a little something. He's one of the toughest kids I ever coached in my life. He came back in. Remember, he fumbled the ball around and almost turned it over. He got fouled and went to the free throw line and made two free throws after he got hurt. THE MODERATOR: Gentlemen, congratulations, we'll see you Sunday.